MomoNote: MomoNote v4.2.1 is now released. MomoNote v4.2.1 is now released. Here are the details for the v4.2.1 update. 1. New search conditions are added to the smart list. Also, search using the #phone, #email, #URL smart list have been added as default. 2. Applied the Retina Display. 3. 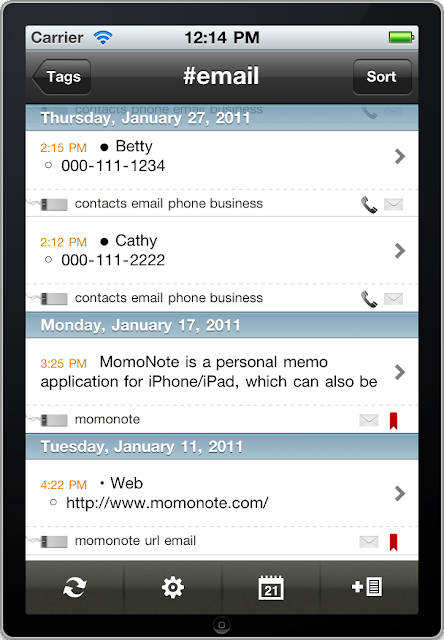 If a memo contains phone number, e-mail, or URL, corresponding icon will show in the memo list. 4. Some of the bugs were fixed. Bug that caused keyboard to disappear when entering camera mode while the memo, given that only input was a tag. A bug which failed to apply the changes in memo list when memo date was edited. A bug which failed to display the link correctly when memo is selected from the iPad. Please send e-mail to MomoNote Support Team if you find any problems after updating to the latest version.